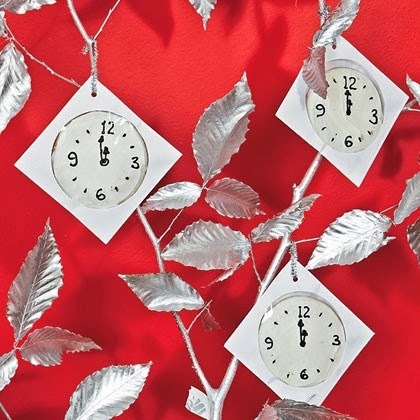 Party Ideas for New Year's Eve ~ Ring in the new year with these recipes, crafts, and games! 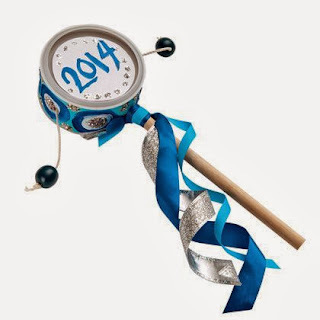 Ring in the new year (on December 31 or on January 31, the Chinese New Year) with this homemade noisemaker, a hand drum based on a traditional Asian design. Use a serrated knife as a saw to cut a 1 3/4-inch ring from the top of the oatmeal canister (an adult's job). Neaten the cut edge with scissors. Paint the outside of the ring, then add glue and glitter if desired. Let the paint and glue dry. Punch a hole in the center of the ring's width. Punch additional, overlapping holes to gradually widen the hole just enough to fit the dowel. Slide in the dowel so that it touches the inside of the ring. Secure the dowel to the ring with glue. Punch two side holes in the ring directly opposite each other. Wrap the ends of the string with small pieces of tape to make them easier to thread. Tie the center of the string to the dowel inside the ring. Thread the ends through the holes and thread a bead on each end. Measure the string against the ring so that the beads will hit the center of the drumhead. Knot the end of the string and snip off the excess. Place the two plastic lids onto the sides of the ring. Cut paper circles to fit the tops of the lids, decorate them, and glue them in place. Tie ribbons to the dowel at the drum's base. Play the drum by holding the dowel upright between your palms and rolling it quickly back and forth so that the beads hit the lids. Grab a spoon and toast the New Year with a cool, sparkly dessert that wiggles. 1. Make bubbly Jell-O® according to the directions on a box of Sparkling White Grape Jell-O®. Be sure to use club soda, seltzer, or ginger ale and follow the tips on the box for getting the gelatin to sparkle. 2. Chill the Jell-O® in champagne flutes or parfait glasses. 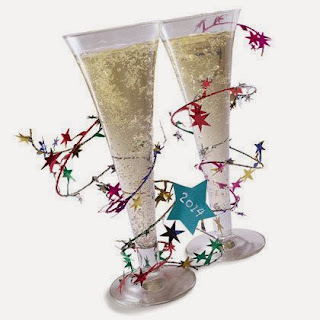 We suggest making these the day of the party, since they might lose some bubbliness if they're made further ahead. Wind a metallic multicolored star garland (available at party stores) up the stem of the glass for pizzazz. Serve a cheesy Times Square ball. Hungry partygoers will cheer our silvery "midnight" snack, inspired by the famed New York City original. 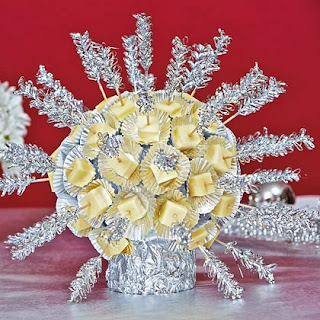 Use an unopened 8-ounce can and a head of cabbage, covered and joined with aluminum foil, for the base. Set 1-inch cheese cubes into mini foil baking cups, then skewer them on frilly toothpicks, inserting the pointy ends into the cabbage. Hold the ball up high, have the kids count down as you lower it to the table, and let snacktime begin. 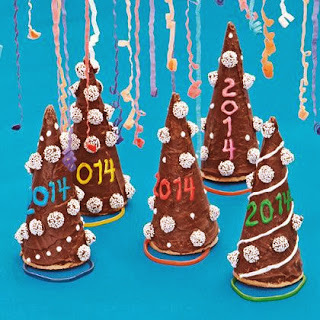 These chocolate-covered cones are a stylish addition to a New Year's celebration, serving as both festive decorations and a sweet topping for a scoop of ice cream. Spread melted chocolate chips over each sugar cone with a small spatula. Let the chocolate harden for about 1 hour (or 20 minutes in the refrigerator). For chinstraps, use icing to attach the ends of a fruit strip or a length of shoestring licorice to the inside of each cone. 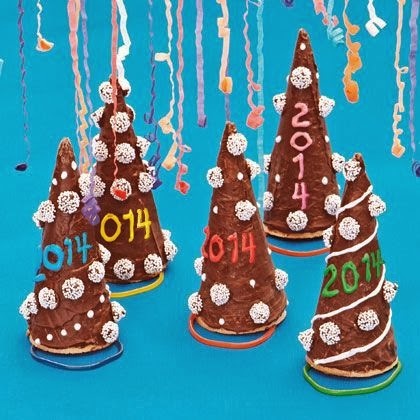 Use icing to decorate the hats and attach nonpareils. This cute coin-headed doll, good for one wish, makes a great New Year's party favor. 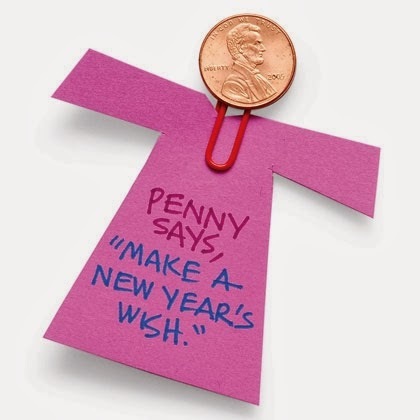 To assemble one doll, use a small ball of poster stick to sandwich the end of a paper clip between two pennies. Then write your message on a small card stock dress and slip it onto the clip. Bake a timely treat this New Year's Eve with these clock cookies. Variations:If you like, hang the goodies from a branch spray-painted silver and stuck in a weighted container ~ here a bucket was used. These clock cookies start with your favorite sugar cookie dough, cut into 3 1/2-inch circles and baked. Decorate the cooled treats with white frosting and add details with black decorator's gel. Let the cookies set overnight, then slip them into CD sleeves.